Tuesday Trivia: How Well Do You Know The Karate Kid?! Tuesday Trivia: Diving Deep on Aquaman Facts! Tuesday Trivia: Getting More Hyped for Captain Marvel! Tuesday Trivia: Just How Much Do YOU Know About Banjo Kazooie? Tuesday Trivia: Facts About Blizzard's Diablo! Tuesday Trivia: Explore Your Knowledge of Avatar: The Last Airbender! Tuesday Trivia: SMASH Your Way Through This Incredible Hulk Trivia! Tuesday Trivia: Test Your Knowledge Of 'The Legend of Zelda'! Tuesday Trivia: Even More Adventure Time Facts! Tuesday Trivia: How Well Do You Know the Menu at Bob's Burgers?! Tuesday Trivia: Die Hard - Trivia with a Vengeance! Tuesday Trivia: A Transformers Film Fact Extravaganza! 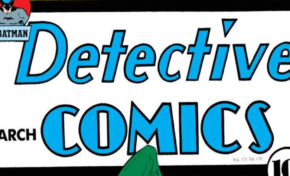 Tuesday Trivia: Are You A Sleuth About Detective Comics?! Tuesday Trivia: Know Enough Facts to Escape from New York? !